The Bujinkan is growing in quantity but it seems to me that some of its original qualities tend to disappear. And 尊敬心 sonkeishin (respect) seems to be the first one on the list of endangered qualities. 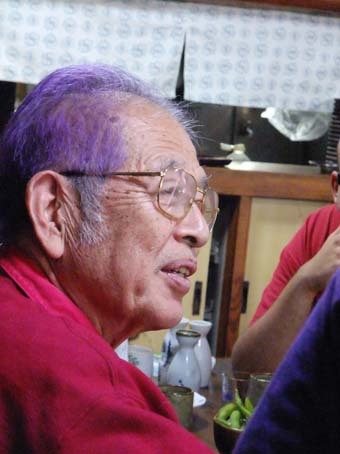 I train Bujinkan because I deeply respect our Sôke Hatsumi Masaaki. The respect I feel for him has nothing to do with the arts he is teaching or showing us but with the man he his. I have been in contact with a few “great men” in my life but none, so far, has been able to mould me and influence me the way he did. I am who I am because I had the privilege to meet Sensei in July 1987 at the first European Taikai organized by Peter. That was nearly 25 years ago (more than half my age) and through Hatsumi sensei’s permanent teachings (martial and non martial) I was trained to become a true human being. The Bujinkan Arts mainly develop one feeling and this is intuition. The Sakki test is the pragmatic proof that one has reached this level of intuition. In Latin, “intuition” is “intuitus” and means the “act of looking at things”. Our Bujinkan training develops our “vision” and we gradually become able to see or “sense” any situation better than many others. The sixth sense is common to all living creature but is rarely accessible to humans. Luckily, the long hours of strenuous training unearth it from within our brain and makes it available to us. Through Hatsumi sensei’s teachings we learn to become more intuitive, i.e. aware of things without apparently thinking. “Don’t think!” as he often say it in class. Intuition is also 感覚 kankaku in Japanese and means “feeling”. The more we “feel” (through our 5 senses) and the more we develop our sixth sense. Now funnily, the word 尊敬心 sonkeishin (respect) is somehow linked to the way at which we look at things. But as “kankaku” exists only in the present, “sonkeishin” is linked to the past. To respect someone is to look at someone’s actions in the past. The Online Etymology Dictionary says it comes “from Latin respectus “regard,” literally “act of looking back at one,” pp. of respicere “look back at, regard, consider”. What someone has achieved in his life is what creates respect. But the Bujinkan growing in quantity I have the intuition that less respect is shown to the elders. Remember that you are who you are because these elders made it possible for you. Look at how Sensei speaks about Takamatsu sensei. This is how you should feel about those who shared with you what you are so proud to have today. Getting a Jûgodan doesn’t free yourself from sonkeishin, on the contrary. With time some arguments, disagreements, and fights might appear with your elders, but you should never show a lack of sonkeishin to them. If you do so then 尊敬心 sonkeishin (respect) will turn into 損敬神 sonkeishi (loss of reverence) and the Bujinkan magic will be lost. Thank you Sensei for your guidance all through these years, and for your help to become an adult. Well said Arnaud. I really enjoy reading your thoughts. I feel grateful that I am able read your insights into training; they help me grow! Thanks for a good article Arnaud. It’s always good to be reminded that we should feel respect to our fellow humans for what they have taught us, or made it possible for us to learn, even if we don’t always agree with everything they do or say. Do you think this tendency with diminishing respect is a direct consequence of the growing numbers of buyu in Bujinkan, or maybe more to do with the current zeitgeist in our society as a whole? My thinking is that it might be the latter, and that we crave to possibility to find the connection with our inner selves now than ever, when the society is taking technological larger and larger leaps forward, and it can be easy to feel a bit lost as a society? This would make the teachings in the Bujinkan even more needed, and can fulfil also this need in our society as a whole? Yes. I agree wholeheartedly. Budo begins with Rei and ends with Rei. And, everything in the space between. All the best with your new dojo, Arnaud. Very nice words dear Arnaud! And both very true and sad at the same time. As a University man I can only clarify that the same principle and attitude is valid for top University studying – the time you are heading for (post) doctorate study you get your mentor (teacher) and you are learning one to one. You share your knowledge, but also emotions making connection on the higher level. Without respect everything is in vain. Thank you for the post Arnaud! I have trained for awhile and been to Japan many times. I finally went to my first DKS this past year. People were very friendly, cordial and respectful during training, but it was a very different “feeling” at the party and afterwards. I am amazed at the number of students that only observe what Soke is teaching in the Dojo and do not apply it to every aspect of life. As you found, I have found also, Soke isn’t teaching Budo, he’s teaching a way of life! Thank You Arnaud for a great post. I’m very new in the world of Bujinkan but I’ve been a martial artist for some time now. I think the growing lack of respect stems from what s00magus said about our society in general. Everything is moving so fast, and technology has less and less humanity as it moves along. Hagakure mentions something about man’s light gradually dissipating over time. I had the opportunity to travel to Japan for my first time last year where I met Soke, and many other great Sensei’s that teach. It was truly an honor to be in their presence and to be totally at one with that moment. It changed my life. The very first night I went to Honbu Dojo to practice, Soke called my partner and I out to demonstrate technique. Please bear in mind I was a white belt at the time so this experience totally blew me away. After so much reading and studying about the organization then to finally in Japan called out by Soke to participate brought me full circle in my life and as a martial artist. I wish I could’ve just followed Soke around inside and outside the dojo assisting him in any way he needed me too. I think, many practitioners don’t even realize who our Soke is. Many are so caught up in the hype and false image of being a ninja that the true nature of what it’s all about. I am so grateful to be a member of this organization and I look forward to many more years of training and respectful evolution. Thanks again for a great post Arnaud.